Governments in developing countries are increasingly considering introducing safety net programmes that provide income for the poor or for those who face a probable risk of falling into poverty, in the absence of the cash or in-kind transfers provided by such programmes. In designing such programmes, governments in developing countries are often faced with the choice between cash and in-kind transfers. Economic theory would lead us to believe that cash transfers are the preferred means of assistance. A range of economic as well as administrative considerations influence this choice (Grosh 1994; Jimenez 1993; Tabor 2002). We would like to acknowledge helpful comments received from Professor Stephan Klasen, which led to a considerable improvement in the paper. 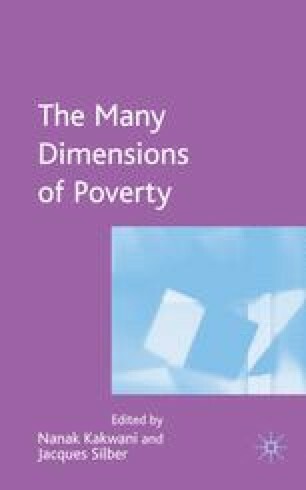 We would also like acknowledge comments recived from the participants of the international conference on the ‘Many dimensions of Poverty’ held by the International Poverty Centre in Brasilia.